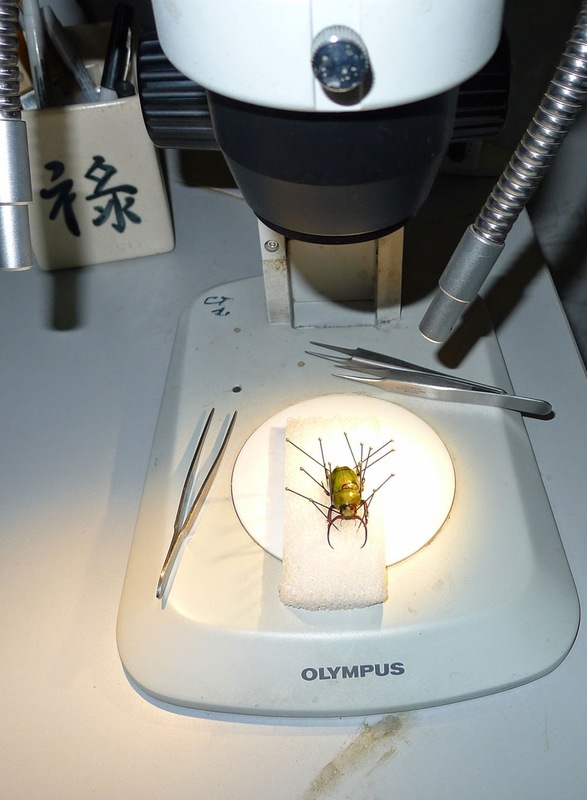 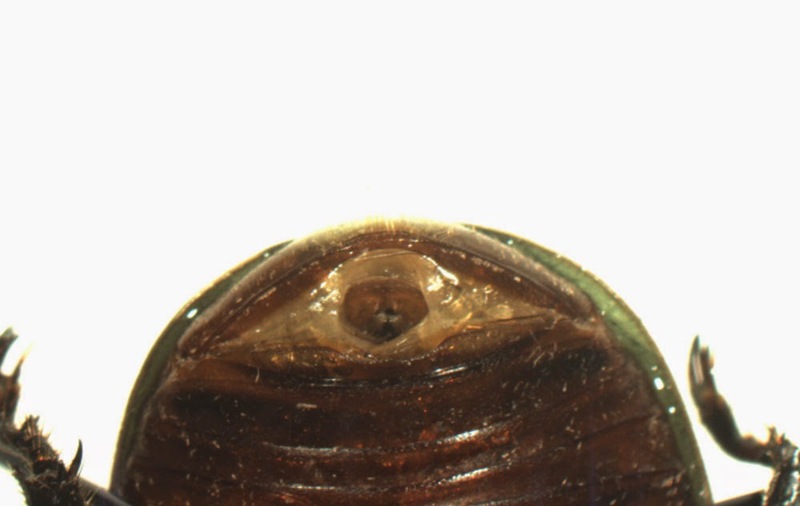 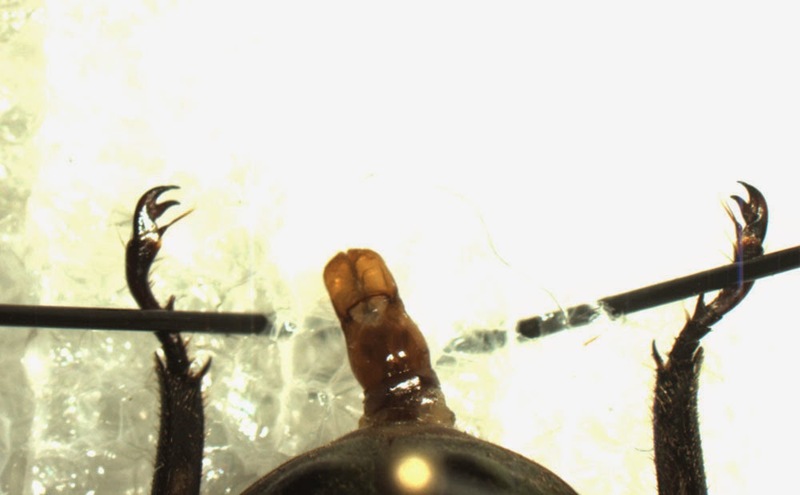 Genitalia analyze is one of very important step of studying taxonomy of insects in general and beetles particularly. 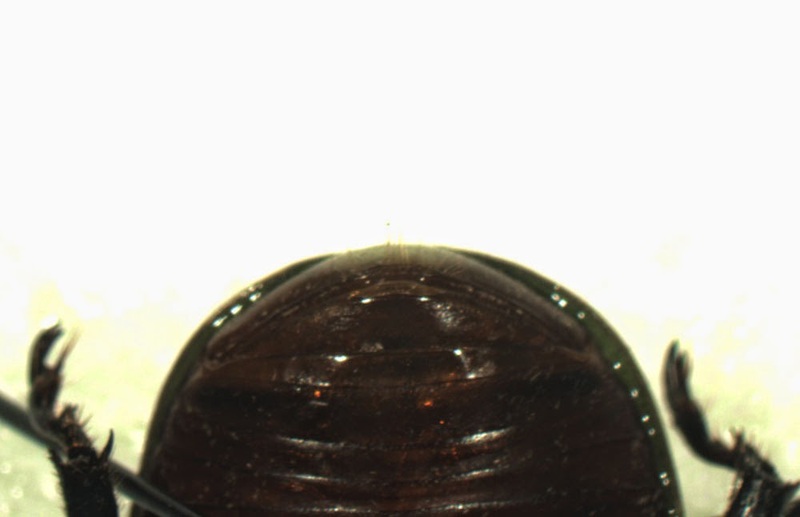 Not only because they are very variable in mature form but also they are very similar among individuals that not belong same species. 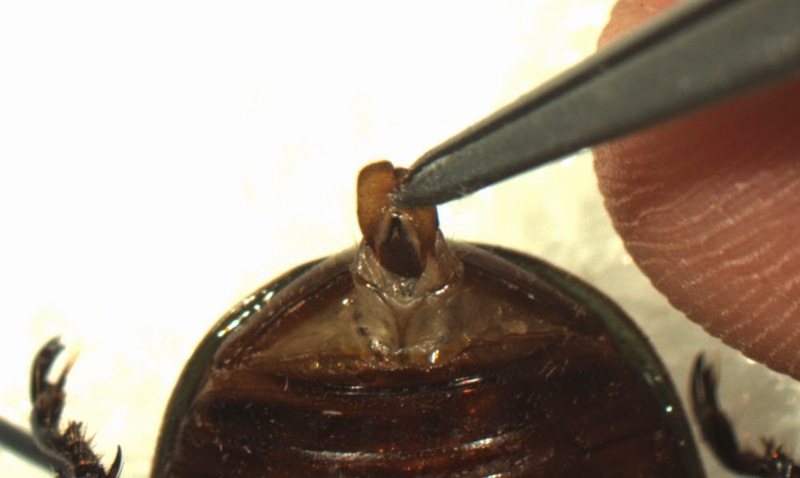 For some group of beetles, genitalia is not the key characteristic for separate species but in some group, the male genitalia is only way to identify them to species level. 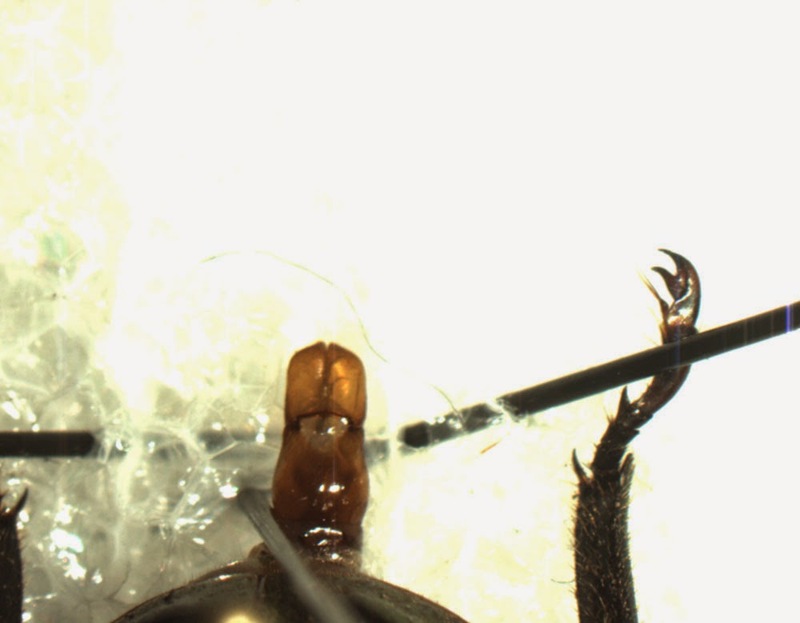 Each taxonomist developed himself a way to study his group, this posting I am going to express how I access the male genitalia of a horned rutelinae for studying without cut them off from the specimen. 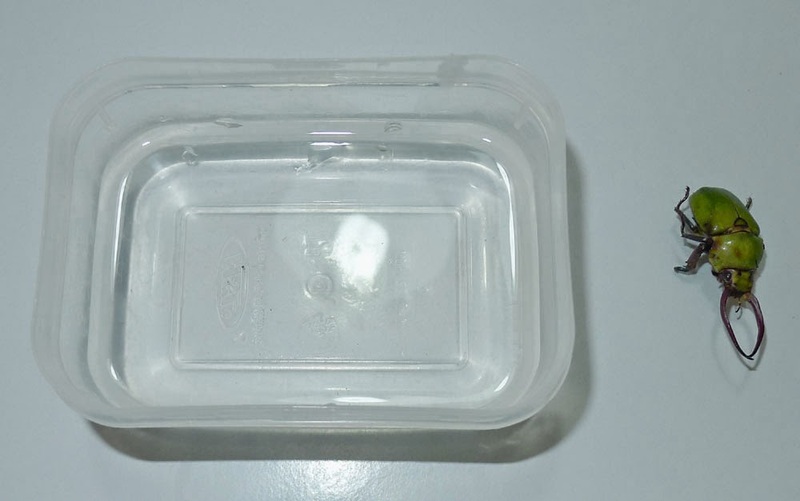 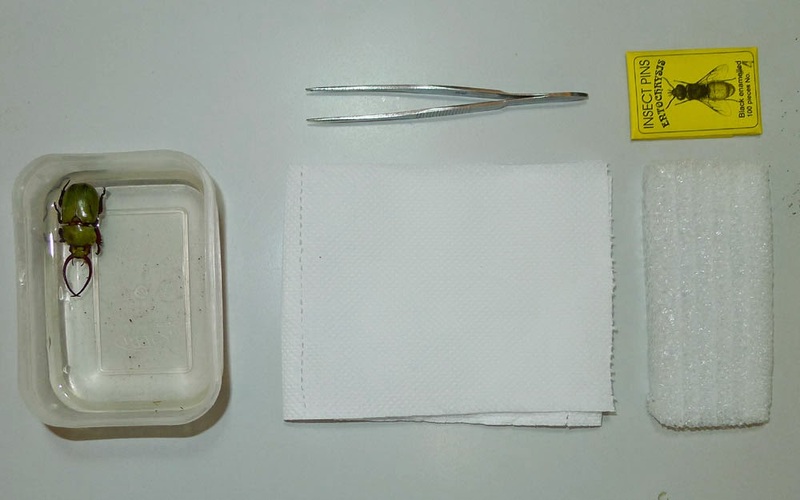 Prepare a hot water cup/box for the dried specimen that collected from the field. 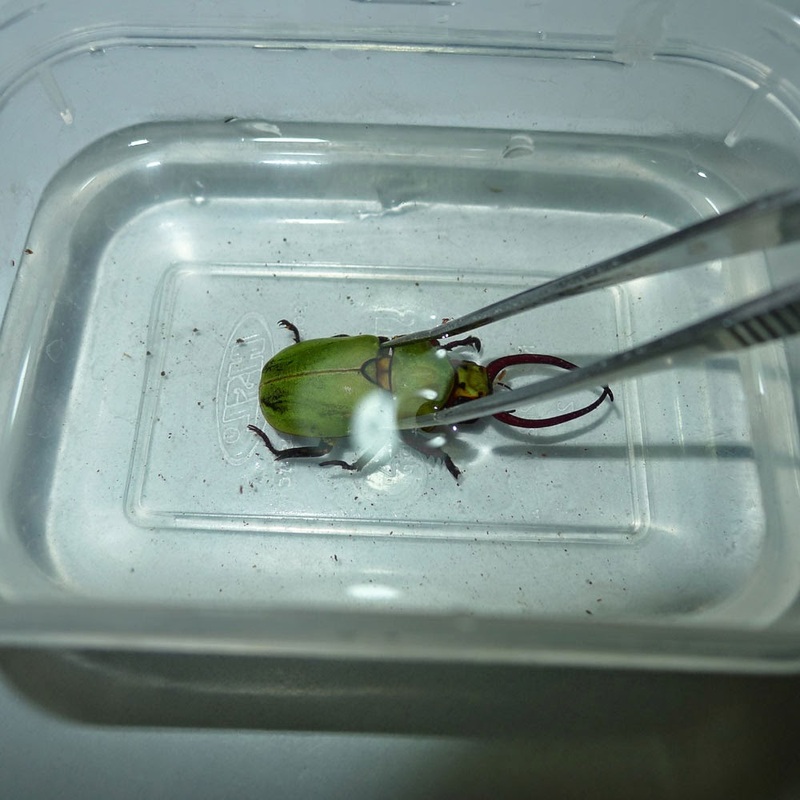 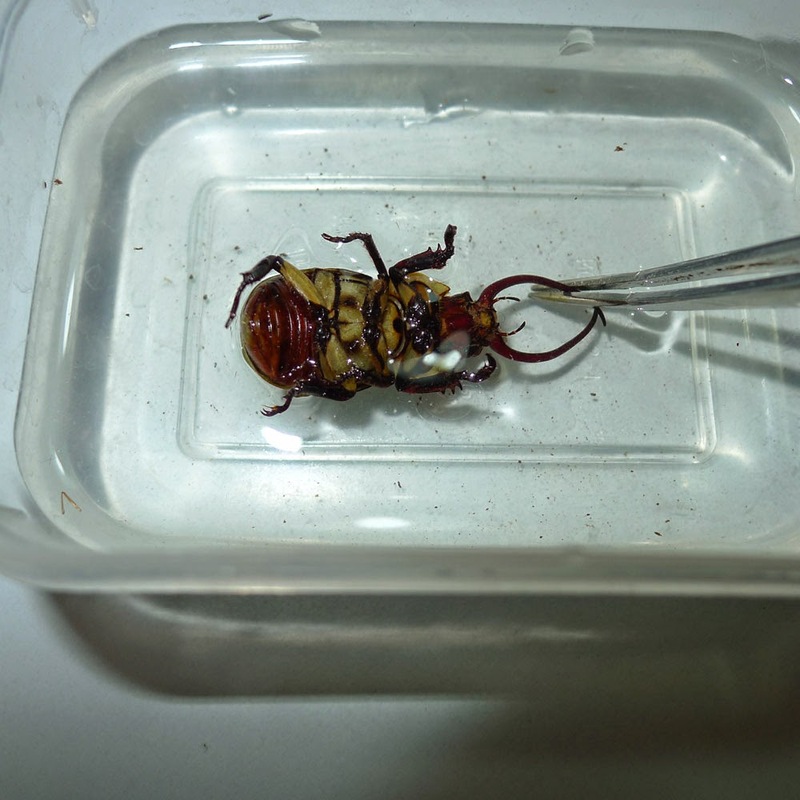 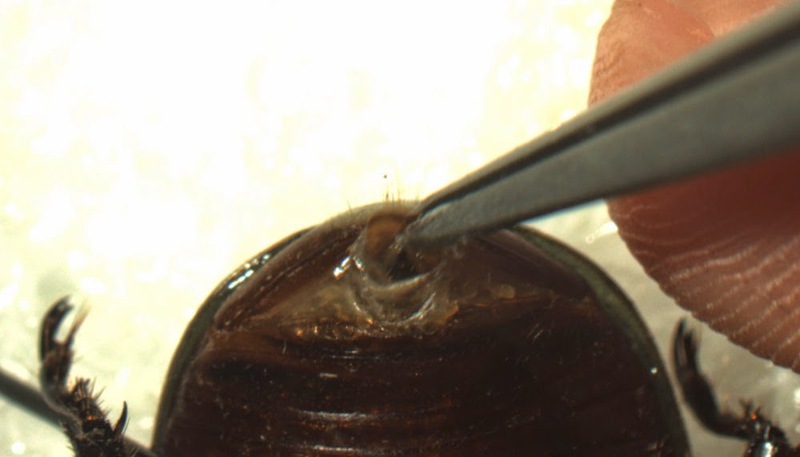 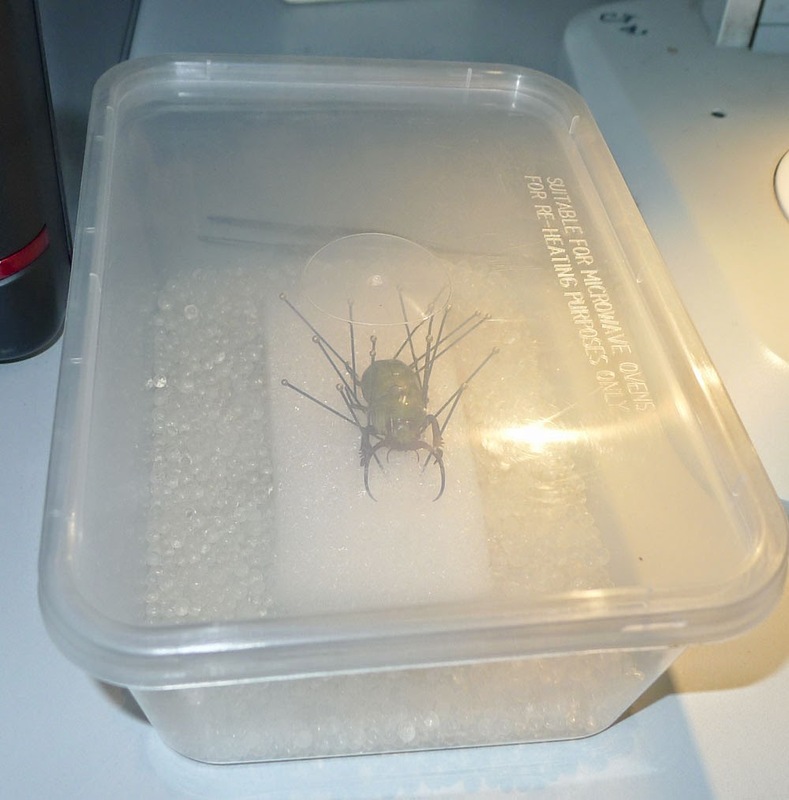 Keep the male beetle into the hot water, duration up to how dried specimen is and with hotter water, the specimen will be flexible in a shorter time (do not reboil water with the beetle in because too high temperature will destroys the pigment chemical agents (color). 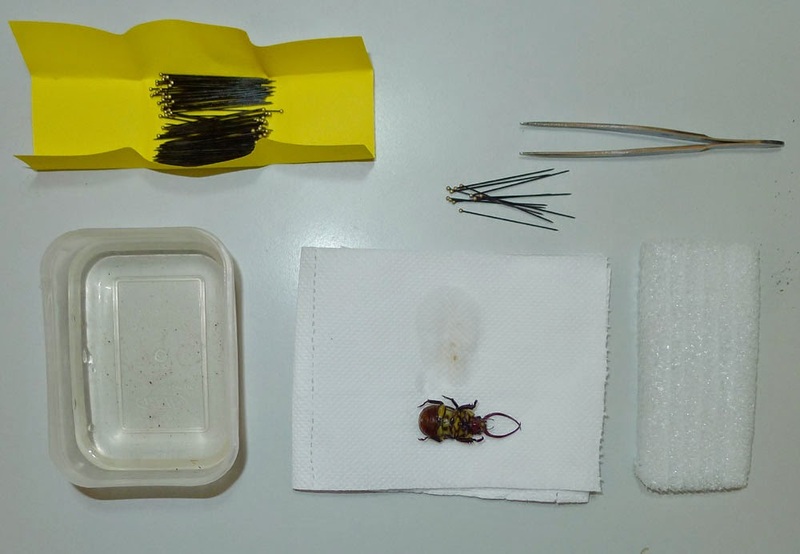 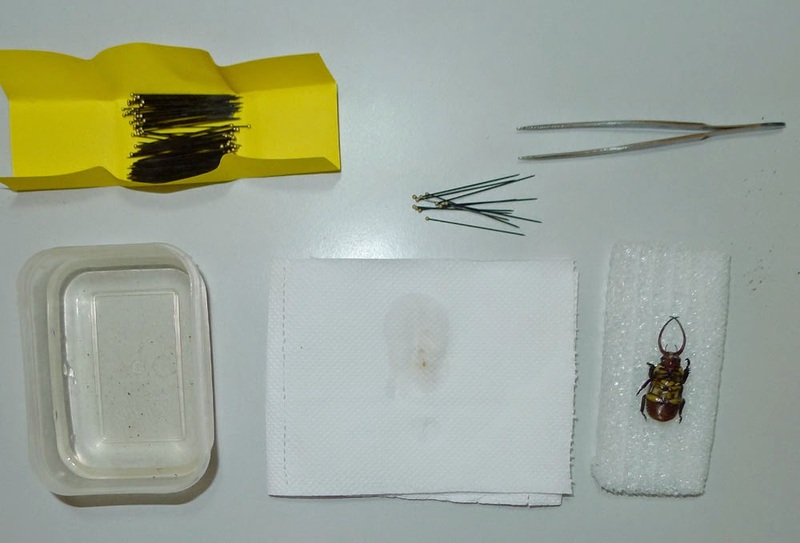 From left to right (below): box of hot water (now maybe warm water) with beetle specimen, soft tissue paper (toilet paper, don't apply an used toilet paper in this case, we need a clean one), foam board; above: forceps and insect pins. 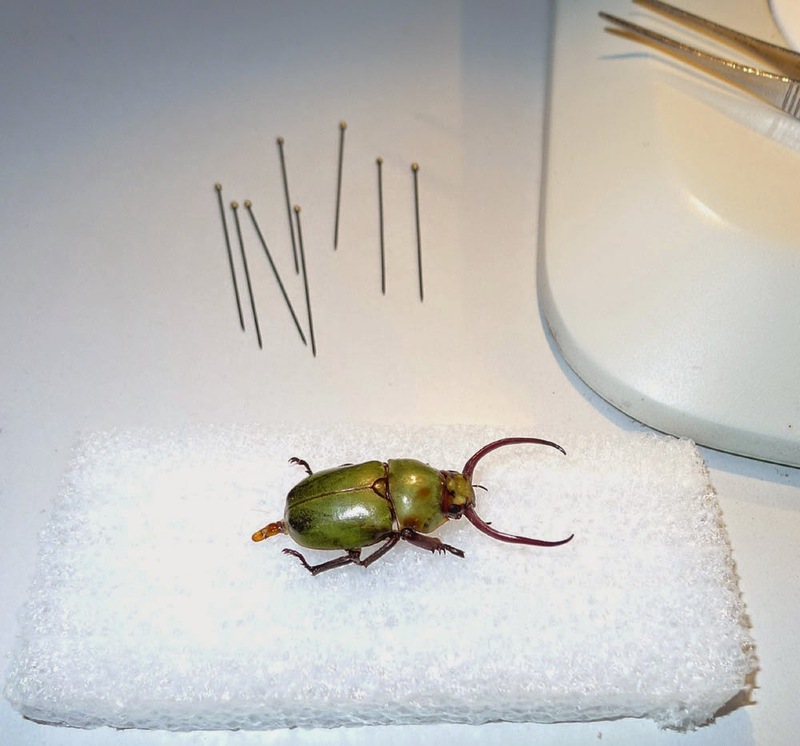 Make the beetle dried by soft tissue paper, both side of the specimen. 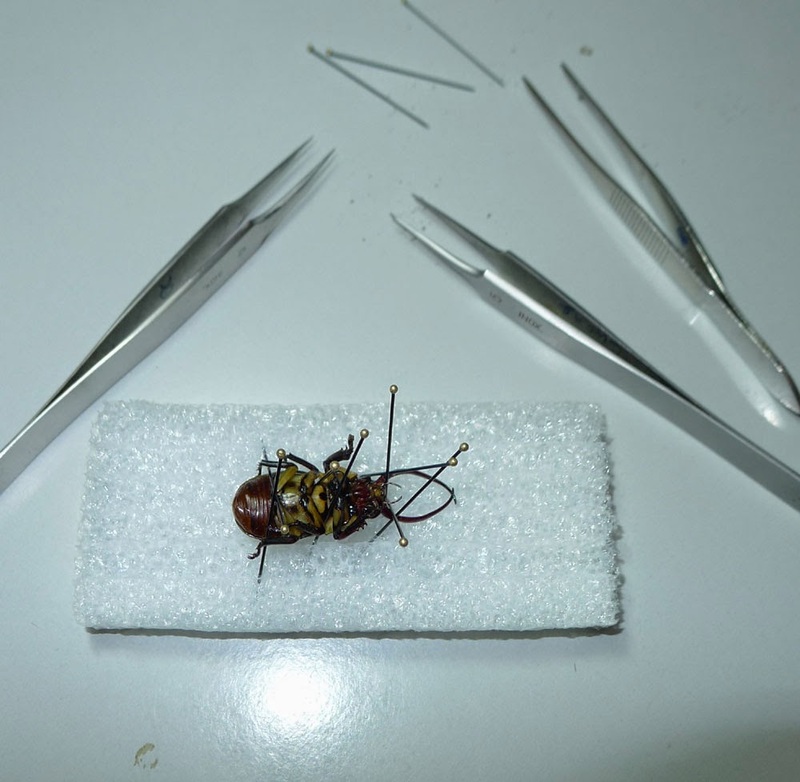 Prepare 2 forceps with point tips, each hand with each one. 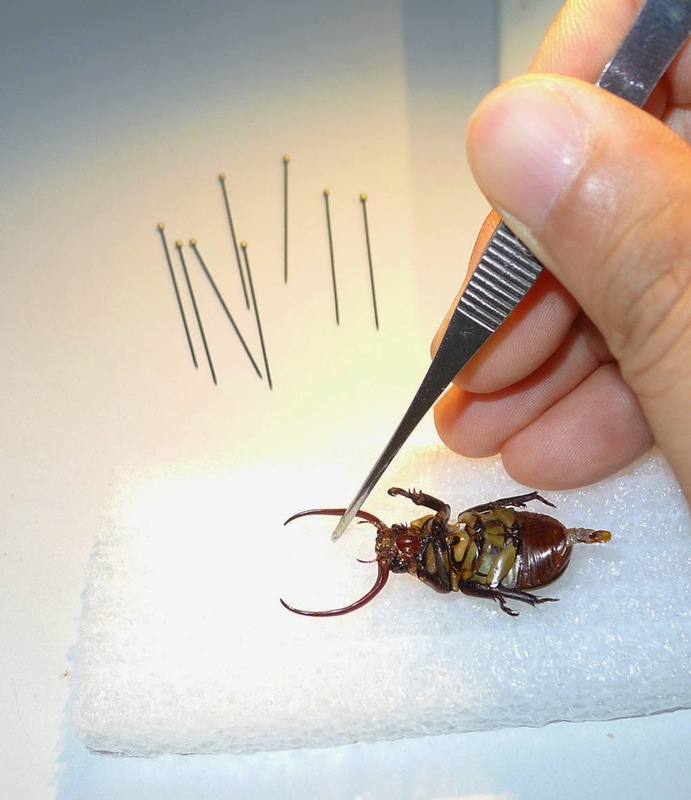 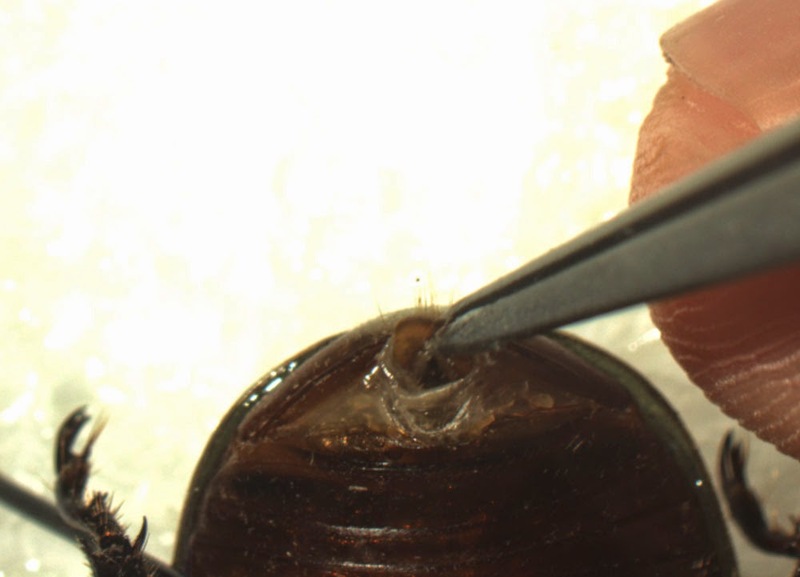 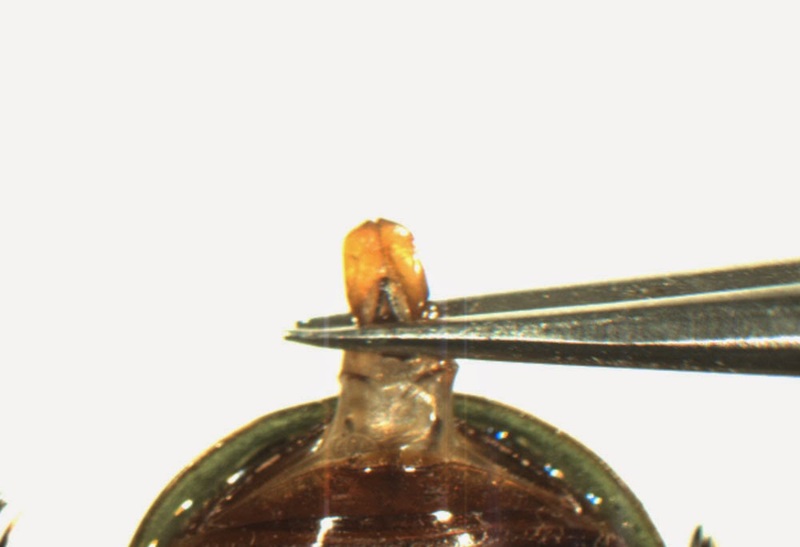 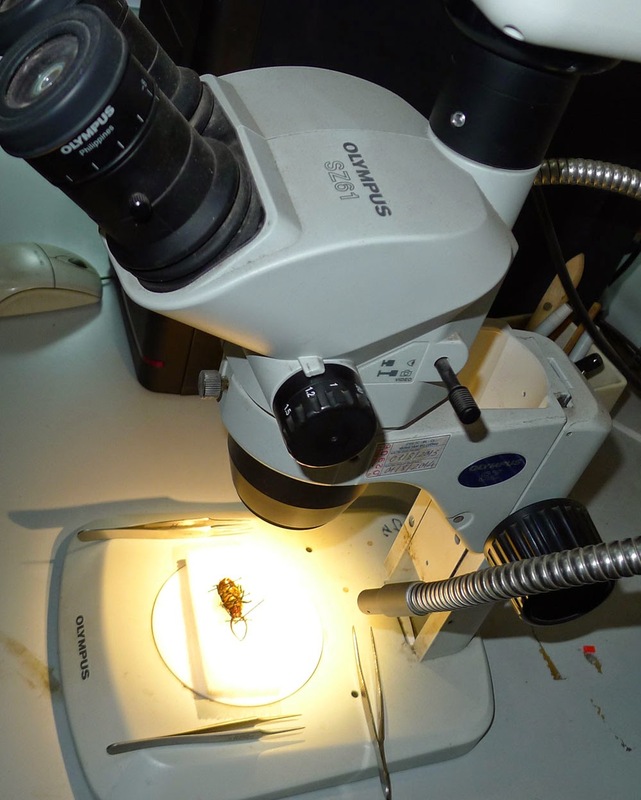 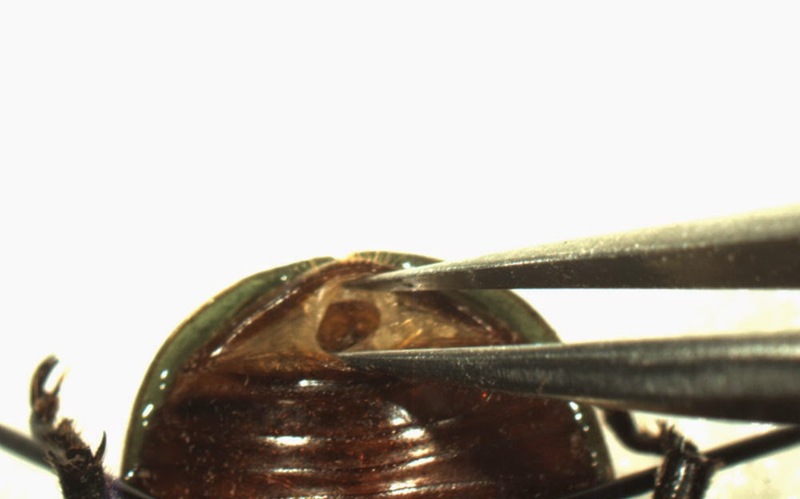 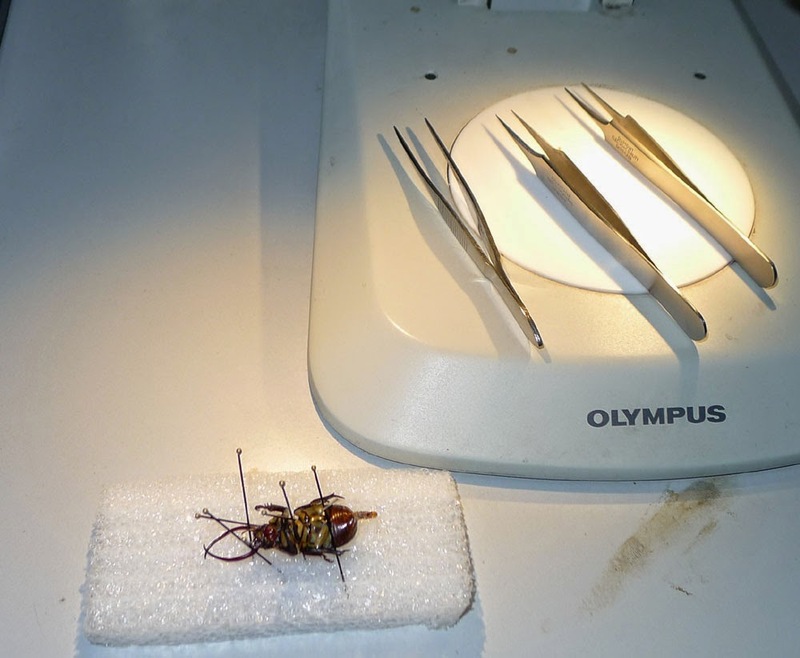 Transfer the beetle to a microscope and see detail the last segment of the abdomen. 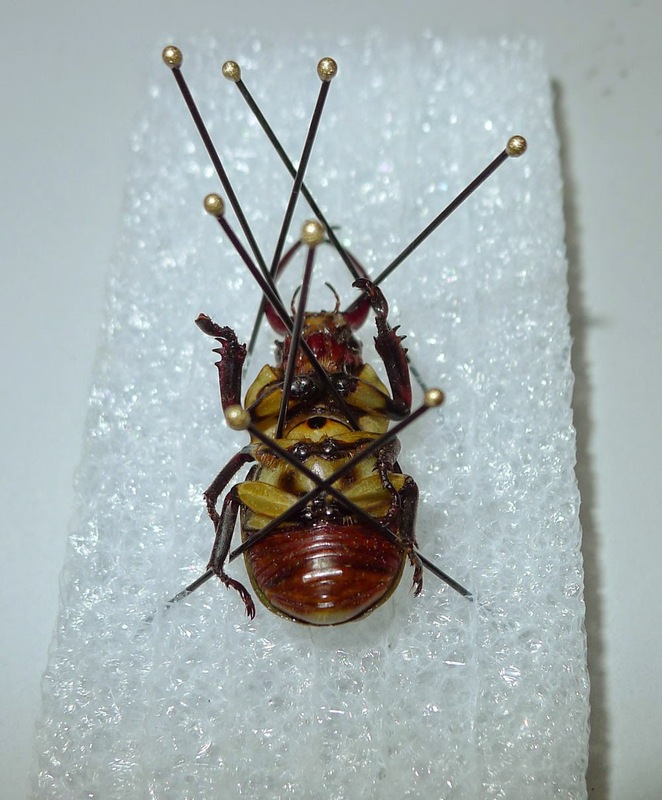 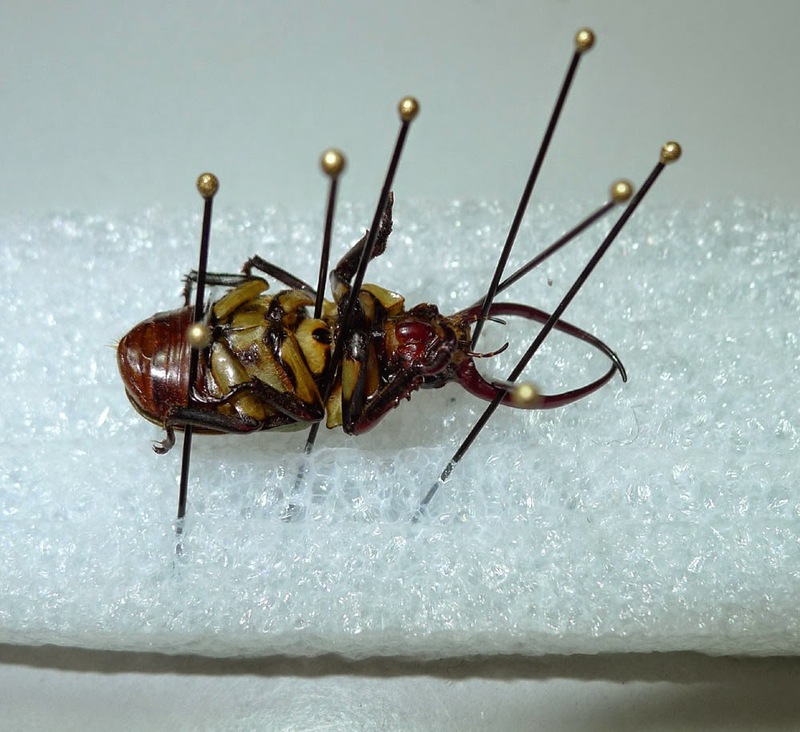 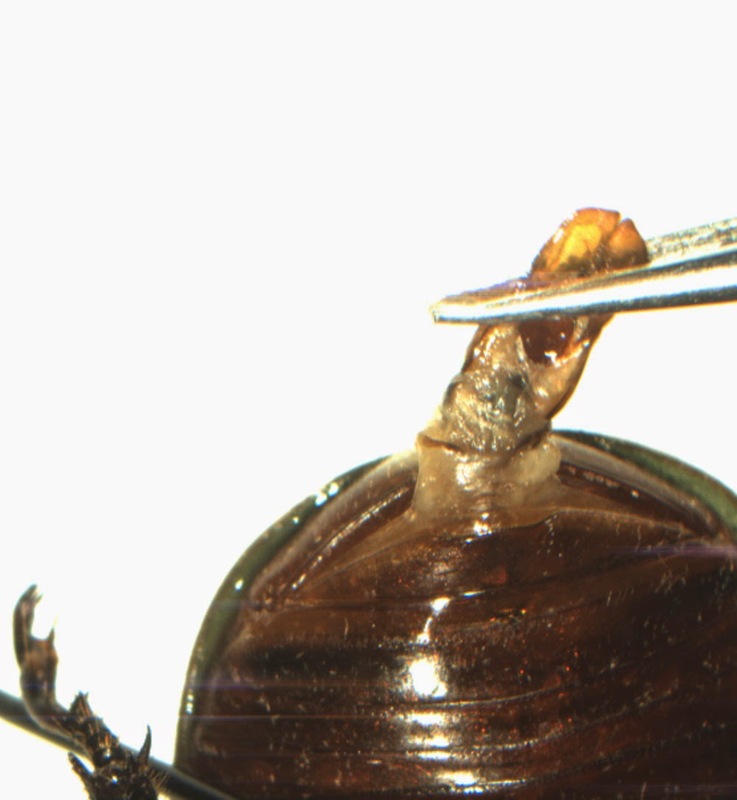 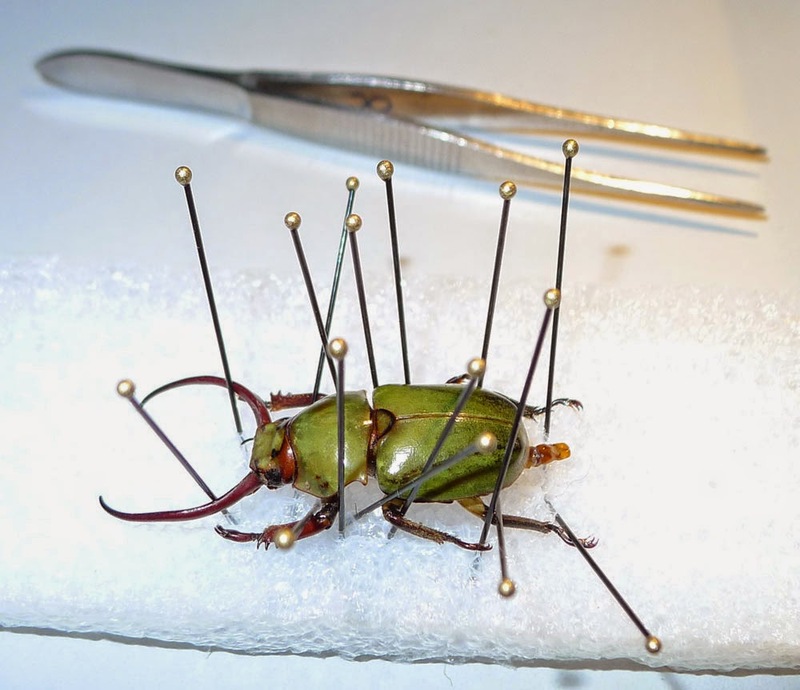 Fix the specimen in dorsal position with insect pins again. 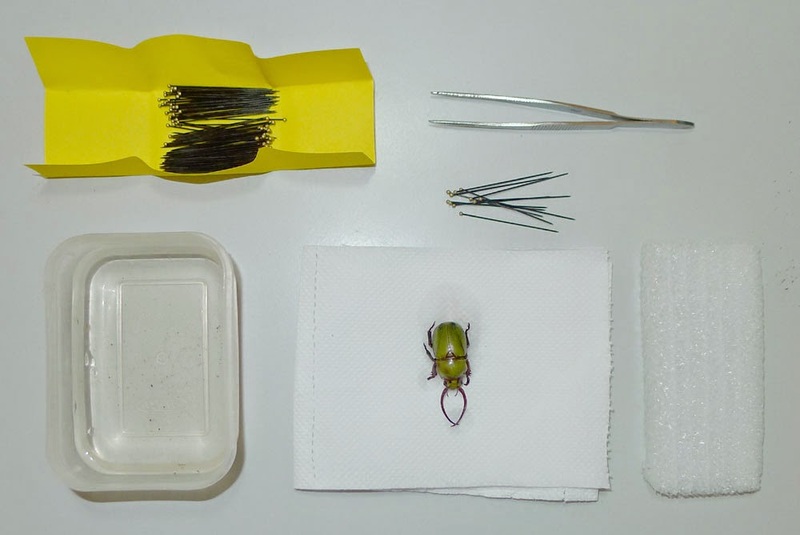 As your specimen full dried up, it will ready for pinning or gluing on the card board, do not forget the data label of the specimen.